The conclusion of “The Ghost of Harrenhal” marks the halfway point of Season 2 of “Game of Thrones,” and we are already down a king. Needless to say, magic and sorcery have gradually been making a comeback since the first scene of the first episode, with our initial glimpse of the White Walker. Everywhere, people continue to deny its existence as anything other than an attempt to entertain and terrify young children like Bran. But it has become increasingly clear that this hesitation to admit magic back into their reality is borne out of ignorance, fear or self-preservation. If they acknowledge the existence of powers beyond their control, then they admit the game has changed forever and they may no longer be best equipped for it. They can either adapt or die. This fact becomes clear in this week’s opening scene, with Renly’s sudden death at the hands of the shadow baby Melisandre birthed in the last episode. This shadow has grown to look remarkably like Stannis and is tactile enough to drive a dagger through Renly’s heart. While this scene should have been bloodier (as described in the book), it is not much less horrifying to simply see the abomination stamp out a lively young man like Renly. Though Renly was not perfect, he could have made a good king, perhaps an even better king (if not warrior) than his late brother and certainly better than most of Westeros’s other options. Renly’s greatest weakness was that he was too proud and self-assured that his land forces would win him the throne with ease. He was glib with his brother when they met to try to broker a deal and paid no heed to Stannis’ threats. Renly failed to realize that the game has changed and that it is no longer about who has to most troops or the greater love of his men. Renly has grown up listening to the heroics on the battlefield of superior warriors like Robert Baratheon and his friend Ned Stark, and he doesn’t realize that the days when bravery won wars are drawing to a close. When the Germans first used chemical warfare on a large-scale at Ypres during the First World War, the Western world was both shocked and horrified. Though the gas was largely nonlethal, the effects were gruesome and painful, and the cultural effects of this new threat were far-reaching. But was gas warfare really worse than having your body torn apart by machine gun rounds or blasted full of metal shrapnel? What inspired such fear and rage among the Allies was something else. Success in warfare was supposed to be determined by the qualities of the men who fought: it was long held that a side’s strength, cunning and valor would earn it the victory. Poison gas, delivered not by a foe you could see and kill, but by the very wind and air you breathe, meant the dawning of an era of warfare where individual strengths and bravery earned you no added protection from the carnage of war. Renly is a skilled statesmen with two of the best knights in the realm serving as his kingsguard, and yet he is powerless against the magical warfare unleashed by his brother. Like Germany’s poison gas, his death is borne by the wind by an enemy Brienne cannot combat. In her grief and rage, she ends up slaying two of Renly’s guards who mistake her for the killer. This is a brilliantly emotional scene that not only shows us how phenomenally skilled (and large) she truly is, but also just how much she loved her lord. She is a strong, brave knight reduced to fear and crippling disbelief because the conventions of warfare that she holds as sacrosanct have been challenged in the most devastating way. Magic and sorcery are rendering Westeros’s few remaining warriors with honor and bravery nearly obsolete (I say “nearly” because Brienne continues to be the most loyal and chivalric of any of them, after the powerfully touching swearing of fealty with Catelyn). The true players are adapting. Tyrion visits the alchemist’s guild to learn about his sister’s order of Wildfire, a magic potion that melts everything, including human flesh. Bronn finds the magical warfare unbelievable and even foolhardy, and at first we think this is what Tyrion believes, as well. After all, they have Wildfire enough to destroy all of Stannis’s ships and men. No matter how strong and brave those bannermen may be, they will lose the war and their lives to magic warfare. Just when you think Tyrion is going to turn away from this horror, he takes the Wildfire into his own account, knowing that it is his only hope for holding the city when his best men are in the riverlands with his father. Meanwhile, Arya has taken up her role as cup bearer for Tywin Lannister at Harrenhal and, while fetching more water for the lion, reconnects with Jaqen H’ghar. In return for saving his life and the lives of the two other men in the prison cart, he grants her three deaths. 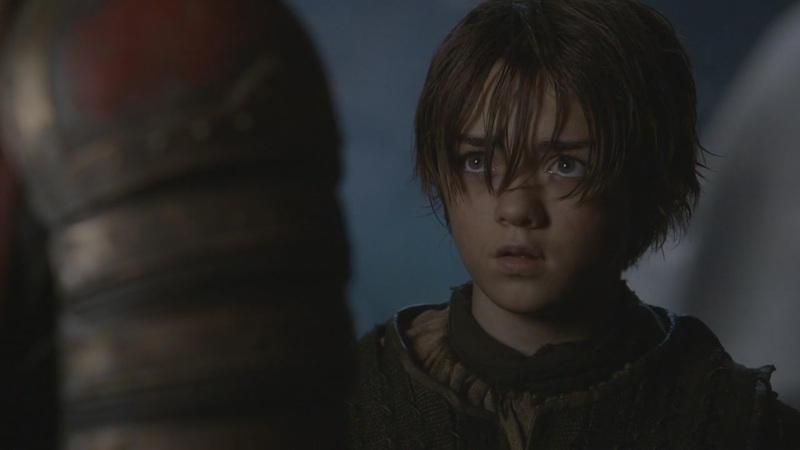 Arya does not quite believe this, and chooses the Tickler as the first man she’d see dead. Of all the names in her hit list prayer, the Tickler (the resident torturer of Harrenhal) seems an odd choice, but it is clear that she does not quite believe in the magic of Jaqen’s offer. After all, in perhaps the best sequence of the episode, Arya had just stared down Tywin Lannister himself and declared that she did not believe the magical stories about Robb (stories like the one where her brother can inhabit the body of his direwolf). Instead, she remarks, “All men can die.” Indeed, that is true now more than ever. However, when she sees the Tickler lying dead and Jaqen looking on with a telling detachment, her eyes open to the mysticism of this strange traveler’s power. All men can die, and no man, no matter how strong or brave, is now safe. – Maisie Williams (Arya) has been submitted for an Emmy this year, thank god. Her performance this episode was outstanding. When she stood toe-to-toe with Charles Dance (Tywin Lannister), she matched the great actor on screen and provided one of the most memorable showdowns of characters’ wits in the series thus far. However, in a far more subtle scene, I really loved the way Williams played Arya looking forlornly onto Gendry (shirtless!) practicing with his sword. She looked so tired, worn down, and more childlike than she’s been in ages. Strong as Arya is, you forget just how young she is and how miserable she, too, must be after losing her family and experiencing such traumas on her own. – The reason why I do not talk about Qarth and Dany much here is that I find her storyline to be rather boring in this part of the series. I felt the same way when I was reading the books. The one positive about these scenes are that they are visually stunning, but Qarth continued to be rather dull this week. The most exciting part was when she fed her dragon. – Someone get Jon Snow a hat. – I’m really excited about what is coming up, and the cinematography of “The Ghost of Harrenhal” cleverly highlighted what we can expect in the next few episodes with a number of character shots looking out into various horizons: north of the Wall, into Stannis’s fleet, through the casks of Wildfire and across the sea to the Northern shores.